Eyebrow microblading is quickly becoming a popular cosmetic procedure to achieve the coveted “brows on fleek” look, but many people still have some questions about what this procedure is and how it works. We’ve asked Diane Makish, Permanent Makeup Provider and Micropigmentologist at the Baumann Cosmetic & Research Institute to weigh in on some of the most frequently asked questions about microblading. Here’s what she had to say. Microblading, also known as eyebrow embroidery, is a relatively new, manual method of reconstructing or filling in thin eyebrows. It is considered to be semi-permanent, as compared to the traditional hair stroke technique, which is essentially a permanent tattoo. Microblading is performed using a very fine blade to deposit pigments into the epidermis. The results last about one year, depending on your skin type. For some people, a touch-up session may be needed sooner to maintain the same look. Microblading offers a very natural-looking, single-hair stroke look that seamlessly blends in with your existing hair to give you the appearance of a fuller, perfectly shaped eyebrow. This procedure does not require downtime, so you can expect to get back to your normal daily activities immediately afterwards. Additionally, microblading results are simple and easy to maintain, unlike eyebrow extensions. You can swim and sleep just as you normally would, without worrying about smudging them. The main problems with microblading happen when improper techniques and inadequate training hinder your results. Although microblading is semi-permanent and will gradually reveal your natural eyebrows over the course of about a year, this also means that some problems may not be correctable if the initial procedure was not performed by a trained and experienced professional. With the current eyebrow trend being dark and thick, microblading procedures require extensive training and proper techniques. 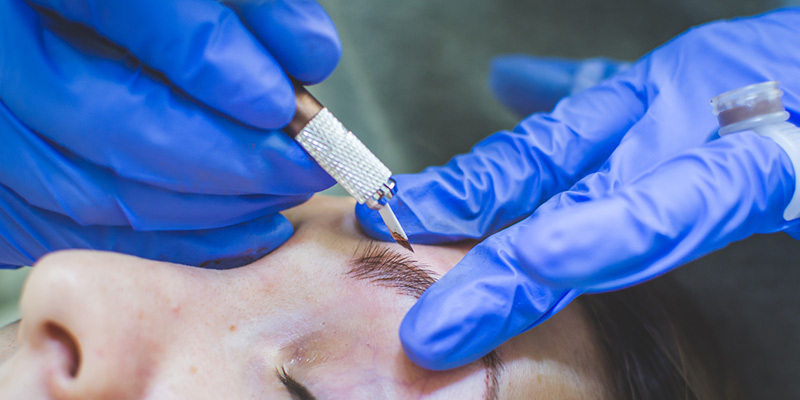 Unfortunately, laser tattoo removal is typically not an option to correct a bad microblading job, as it will also permanently destroy the hair follicles of your natural brows, so they will never grow back. Thus, this is only an option for those with no eyebrow hair underneath the added pigment. Some microblading educators and schools are promoting this new procedure as a skill that can be learned in one week, and that new practitioners can charge their clients $800 per session. This, however, is simply not true. It takes years of practice to understand and master how each skin type takes pigment, and how to adjust for each of these individual differences. Regardless of the technique being used, make sure you check credentials, length of practice, and prior work portfolios before choosing a practitioner for your microblading procedure. You should also be wary of “too good to be true” deals or offers, as these are most likely not going to be administered by a trained and experienced professional. If you’ve chosen a reputable practitioner, you should feel confident in his or her ability to listen to your goals and design a custom-tailored microblading procedure to meet those needs. You should expect that your practitioner will draw on your new eyebrows prior to beginning the microblading process, just to make sure you’re happy with what the results will look like. It’s also extremely important to keep in mind that microblading is not a “one size fits all” procedure, and just because the current trend may be the dramatic Joan Crawford eyebrow doesn’t mean that this look will complement your natural features and facial symmetry. Work with your provider to achieve results that will not only satisfy your cosmetic goals, but will also enhance your natural beauty.